The beginning of the golden weather Conditions have definitely been golden (and silver and bronze) for four of our local craft beer and cider makers as they earned well-deserved accolades at this year’s brewing awards. Junction visited them – and we recommend you get out this summer to sample the local award-winning tipples as well. At the Brewers’ Guild of New Zealand awards in September 2015, 8 Wired entered 13 beers and won 12 medals, including two gold for their Hopwired and Hippy Berliner beers, respectively. Chief brewer and owner, Soren Erikson agrees that 13 beers is quite a handful but in reply to the suggestion that he might cut that number down, he says, "No, I want to make more!" Soren is obviously passionate about his brewing and his eyes light up when he talks about making sour beer from the hundreds of barrels stored in the warehouse. Much like a wine maker, he's always sampling and blending the different brews to try and get the perfect result. Established in 2009, Soren and wife Monique, who is co-owner, decided they wanted to move 8 Wired north from Blenheim, and chose Warkworth as the ideal base for their brewing venture. While half of 8 Wired’s product heads overseas, Soren would like to increase his fresh beer offerings in New Zealand so in 2016 you can look forward to trying more tasty brews by the glass at Tahi Bar in Warkworth. The beginnings may have been No. 8 wire technology but the results today are gold ribbon. "When you own an orchard, a cidery and a cider restaurant, you have to have a harvest festival. It would be a sin not to." So says Alan Spinks of Forbidden Brewing Company. Along with his son, Jordan, who is the brewer, there is a real sense of ‘anything goes’ and seeing where the adventure will lead. 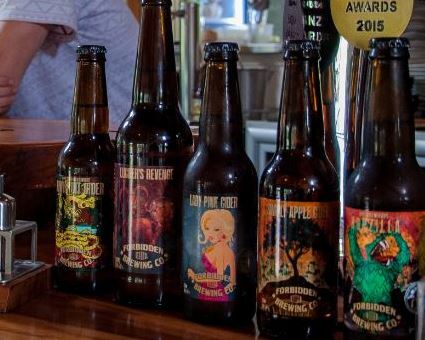 Forbidden Brewing is only two years old, but they have just won a handful of medals and the trophy for Champion Cider at the Brewers’ Guild of New Zealand awards in September 2015. However, there's no time to rest on their laurels as they prepare their new dedicated smokehouse and cider restaurant for launch, and plan for a harvest festival in April. Bold packaging and flavours are encouraged but within strict boundaries of quality, authenticity and staying natural. Says Jordan, ‘We’ve experimented with all sorts of flavours, including pears, plums, pineapple, coconut, lime, mint and even Thai basil – pretty much anything I can find in the orchard, I’ll try out.’ Alan points out, though, that all the ciders are still 99% apple juice and the ‘funky flavours’ are subtle – and never overwhelm the cider taste. Forbidden Brewing is a little bit brash, a little bit brassy, definitely naughty – and a whole lot of golden delicious. It says a lot about the rapid growth of craft brewing in New Zealand that, at a mere 11 years old, Sawmill Brewery is one of the old hands in the industry. In preparation for the precocious teenage years ahead, Sawmill has a new, purpose-built brewery, restaurant and bar on Leigh Road. From not having enough room to produce the quantities or range of beer they wanted, owners Mike Sutherland and Kirsty McKay will now have the ability to brew up to one million litres of beer per annum. The beautiful rural location sets them apart from many craft breweries, Kirsty explains, as others tend to be located in cities and industrial areas. The bar will offer up to 15 Sawmill brews on tap, plus a guest tap. Included in those beers will be the nine medal winners, gold, silver and bronze, from the 2015 Brewers’ Guild of New Zealand awards. To complement the beer there will be a small menu of "beautiful, simple, generous, good food," says Kirsty. She's also excited about offering refills for flagons. The Sawmill retails two different sized flagons – the Growler and the Squealer – that are branded with the iconic circular saw logo. "I love it because the beer is fresh from the source, there’s less waste, it’s more economical and it’s more social – it fits with all our values." It’s all about tradition for Lesley and Philip Lindesay of Jones Road Cider. They’re the new kids on the block, having only opened their cellar door last summer, but the cider apples in their orchard are generations old. Those apples are the key to their success. Lesley and Philip developed a taste for traditional cider during their travels to Europe and the USA. ‘When we returned to New Zealand, we simply couldn’t buy proper cider so we decided to make our own,’ says Lesley. The orchard now has around 1200 trees and over 50 varieties of cider apples. Lesley explains, "Our cider is made the same way as wine. We have a cider maker who blends the different varieties of juice, it ferments for around six months, it’s bottled, and then we age it in the bottle so that what we’re selling contains apples picked 18 months ago. That’s how real cider is made." That dedication to authenticity earned Jones Road a silver medal at the New Zealand Cider Awards this year.